Daniel Ruiz-Carrascal stands on a mound of jagged rocks that seem out of place in the otherwise smooth and grassy landscape. “The glacier was here in the mid-1500s,” he explains. The white peak of Nevado Santa Isabel looms a mile ahead and about 1,300 feet taller than our own dizzyingly high elevation. It’s hard to picture that white stretching all the way down to this rocky hill, burying the entire valley in ice. 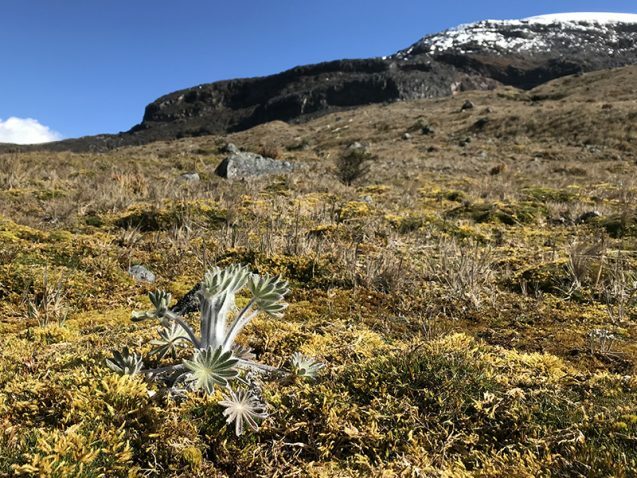 Ruiz-Carrascal brought me here into the Colombian Andes to visit the páramo, one of the most unique ecosystems on Earth—and one of the most threatened by a changing climate. 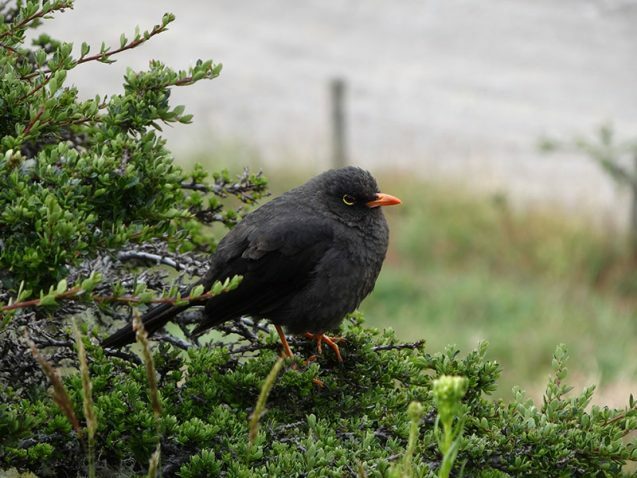 The páramos can only be found in the Andes mountains at altitudes above 12,500 feet. The air is so thin that you can lose your breath standing still. The weather can be treacherously rainy and snowy, and every day the temperature fluctuates from below freezing to around 60 degrees Fahrenheit. Yet despite the harsh conditions, the páramos are the world’s most diverse high-altitude ecosystem, home to an estimated 5,000 species—3,000 of which live nowhere else on Earth. This ecosystem isn’t important just for plants and animals. Throughout the Andes, the páramos act like a sponge, collecting water from fog, drizzle, and melting mountaintop glaciers, storing it, and then releasing it into the lowlands. An estimated 40 million people—including residents in Bogotá, Colombia and Quito, Ecuador—depend on the páramos for drinking water. Sadly, the tropical Andes are warming faster than anywhere else outside of the Arctic Circle. The glaciers are melting, less precipitation is reaching the mountaintops, and the páramos are drying out. Species are forced to migrate to higher and higher altitudes to seek out the cold temperatures they’re adapted to. Eventually, there may be nowhere left to go. 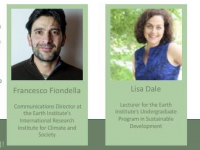 Ruiz-Carrascal, a hydroclimatologist and adjunct at the International Research Institute for Climate and Society (IRI) at Columbia University’s Earth Institute, is working to understand these changes and evaluate adaptation strategies. 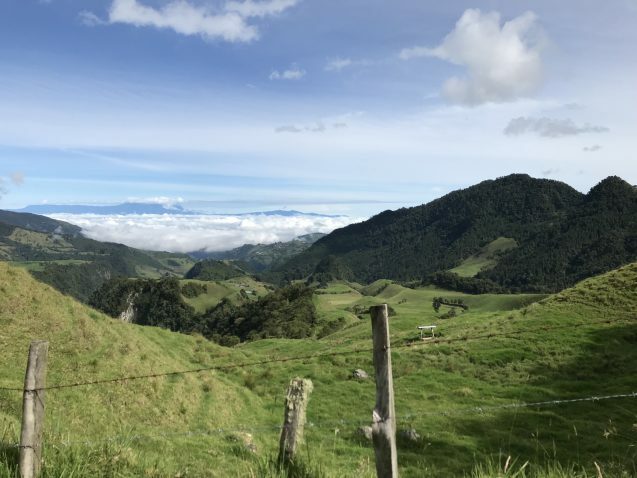 Leading a team from the Escuela de Ingeniería de Antioquia (EIA) in Medellín, he has set up a network of sensors to measure the changes taking place in the páramos and to understand what the future holds. The team is one of just a handful doing long-term studies of this extraordinary and important biome. 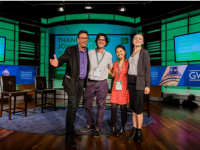 Ruiz-Carrascal is an alumnus of IRI’s Climate and Society master’s program. He received his PhD in Earth and Environmental Sciences from Columbia University as well, and decided to focus his research on high-altitude environments. He’s been hiking into these mountains all his life. 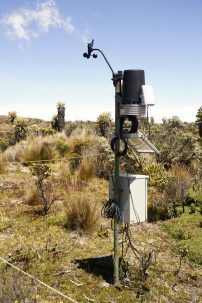 Very few weather stations are installed in the páramos—the altitude and remoteness make it too difficult to operate and maintain the equipment. As a result, there’s been a large gap in scientists’ understanding of what’s happening in the high elevations of the Andes. 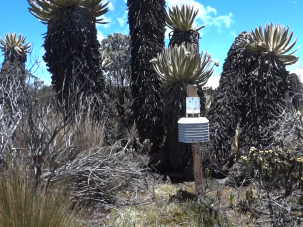 That’s why Ruiz-Carrascal’s team has installed 23 sensors in the páramos of Colombia’s Los Nevados region. The sensors track temperature, relative humidity, and dew point every hour at altitudes of up to 16,000 feet. Every couple of months, the team rides into the páramos to collect the data from their sensors, and take other measurements. “We’re taking science to the limit,” Ruiz-Carrascal tells me in his office at EIA, where he’s an associate professor, before we set off on the long and bumpy ride into the mountains. Mornings bring clear skies in the páramos, while the valleys below swim in a sea of clouds, pushed down by chilly temperatures. 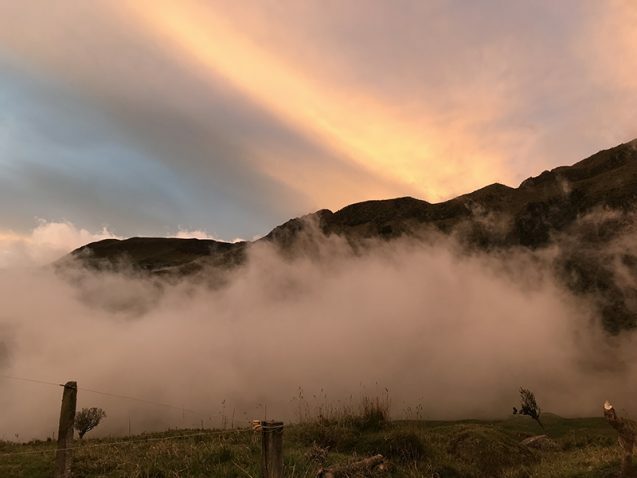 As the day warms up, those clouds usually rise, carrying fog and drizzle into the páramos. This upward flow of moisture is like the páramo’s blood supply. 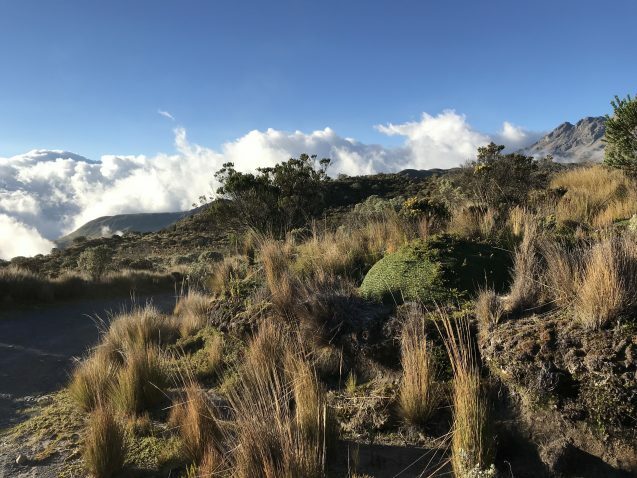 But Ruiz-Carrascal’s team is finding evidence that the circulation patterns that deliver this moisture are changing, causing the upper ranges of the tropical Andes to warm up and dry out very quickly. According to the team’s sensors, the páramos are warming about 1.6 times faster than the surrounding lowlands. This rapid transformation appears to be driven by unusual warming in the region’s upper troposphere. Under normal circumstances, as a patch of air in the lowlands heats up, it becomes less dense and floats upward. The parcel of air will continue rising as long as it remains warmer than the air around it. Eventually, it cools and releases water in the high altitudes. However, the team thinks that in the future, those air patches won’t be able to rise as high as usual, except during very unusual events, and the páramos will receive less water. 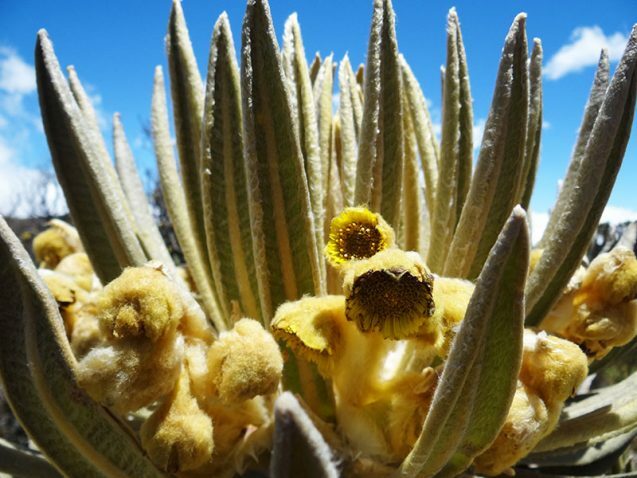 If the Colombian páramos had a poster child, it would be Espeletia. These plants are nicknamed frailejones—big friars—thanks to their sometimes towering heights and thick brown stems, which could theoretically be mistaken for monastic robes on a foggy day. Espeletia are unique to the páramos. 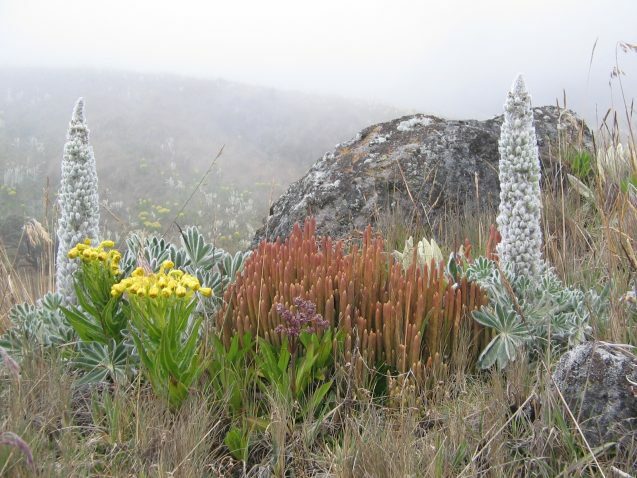 And because their stems absorb moisture from fog and route it into the ground, they play an important role in regulating páramo water supply. Doing his best to draw on a notepad while our all-wheel-drive vehicle bounces along a dirt road, EIA environmental engineer Enrique Ángel-Sanint explains to me why Espeletia play an important role in the team’s research as well. Instead of brown robes, their stems are cloaked in dead leaves that never drop. And because each individual may live for a century or longer, those leaves could provide a rich library of the páramos’ past climate—if the team can figure out how to read them. The first step is learning how Espeletia grows. For this, Ángel-Sanint uses a plastic “sewing kit” full of pins, rulers, and protractors to measure the plant’s growth rate throughout its lifetime. “Once you have this, you can see an individual’s height and deduce its age,” he explains. Then, because the leaves grow in a very predictable way—his squiggled drawings show them springing out of the crown, fresh and tall, then flattening downward and dying as the plant grows—he’ll be able to give a specific age to each leaf. By correlating features such as the size and density of the leaf’s microscopic pores, called stomata, Ángel-Sanint hopes that each leaf will provide a record of humidity levels just before it was born, whether that was one year ago or 130. The El Niño climate pattern, driven by ocean and atmospheric temperatures in the Pacific, dramatically exacerbates warming and drying in the páramos. 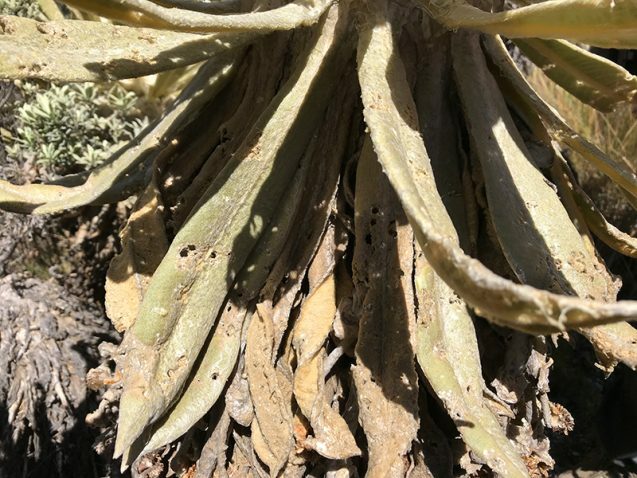 In the past, after these dry periods, Espeletia’s leaves would likely have responded by producing leaves with fewer stomata, through which they could lose water. 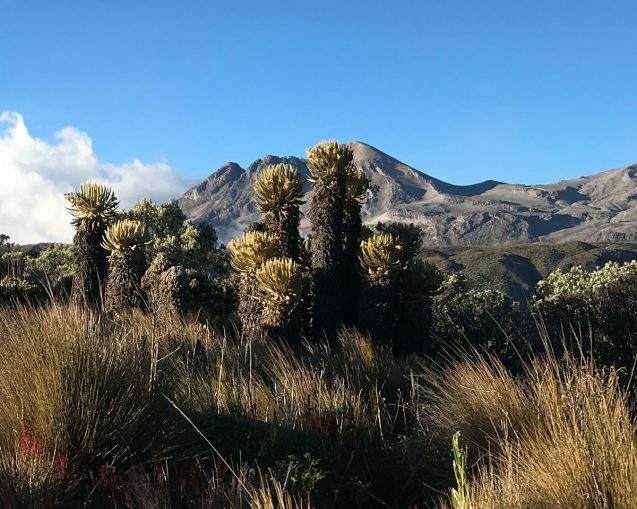 By putting Espeletia’s leaves under a microscope, the team hopes to figure out whether El Niño events are becoming more frequent due to climate change—and what that might mean for the future of the páramos. 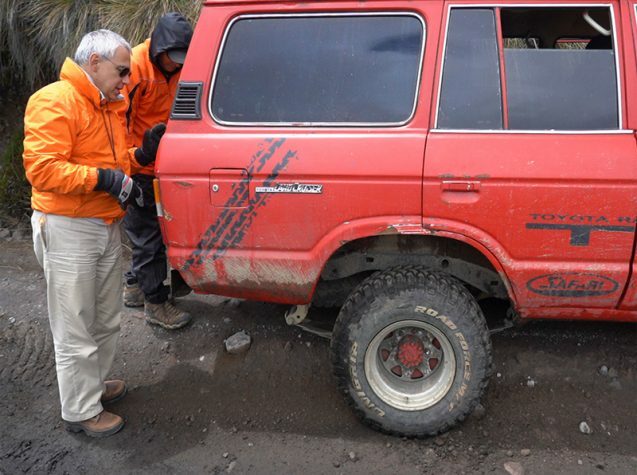 When Ángel-Sanint visited Los Nevados 30 years ago, he saw snow and ice capping the El Cisne volcano. Now its peak looks brown and barren. Nearby, the Nevado Santa Isabel could be next. Between 2016 and early 2018, it lost 37 percent of its remaining ice area, including about 11 meters of thickness in some places. 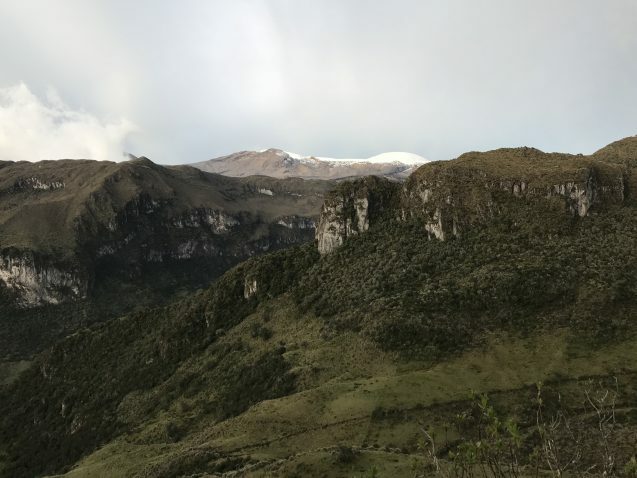 Colombia’s glaciers have been slowly shrinking for thousands of years, since the end of the last ice age. But in the past few decades, the receding rate has risen dramatically because of manmade climate change. Since the 1950s, Colombia’s glaciers have diminished from 113 square kilometers to just 37 in 2017. They could completely vanish within the next 30 years. 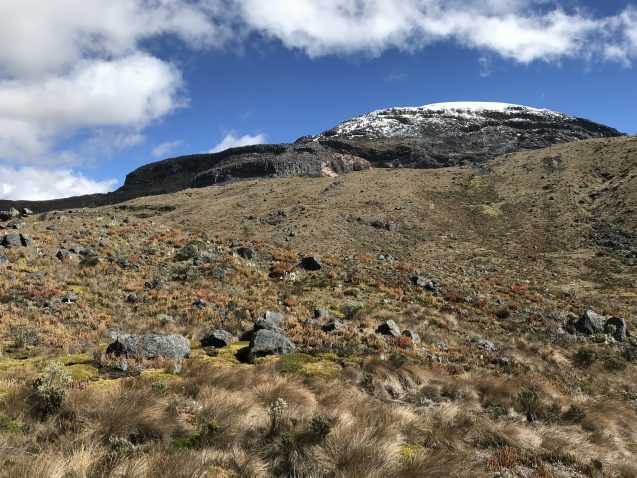 To better understand what the loss of the glaciers means for the páramos and the people that depend on them, Ruiz-Carrascal and teams from the University of Ireland at Galway and Universidad Nacional de Colombia Sede Medellín are studying the rocks that the retreating glaciers left behind. Pushing his foot into some loose soil on the trail, Ruiz-Carrascal shows how soil and rocks build up in front of a glacier tongue as it grows and spreads during cold periods. Then, as the climate warms, the shrinking glacier pulls back, leaving behind the mound it had once pushed in front of it—a moraine. Scraping off samples from the moraine rocks, the researchers can use helium-3 and beryllium-10 to estimate when the glacier left behind each footprint. Together with clues from the landscape, the teams are reconstructing the glacial history of the region, creating a record of the timing and extent of glacial movements over the last 20 to 30,000 years. Andean glaciers have ebbed and flowed many times over that time period, and the páramos grew and shrank—and regrew—along with the ice caps. Will they be able to recover from the high-speed human-made onslaught that’s frying them now? 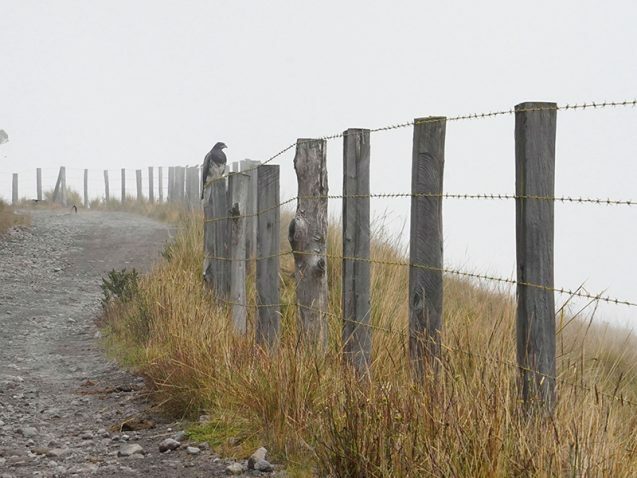 To find out, ecologist María Elena Gutiérrez-Lagoueyte from Universidad EIA is studying páramo resiliency. 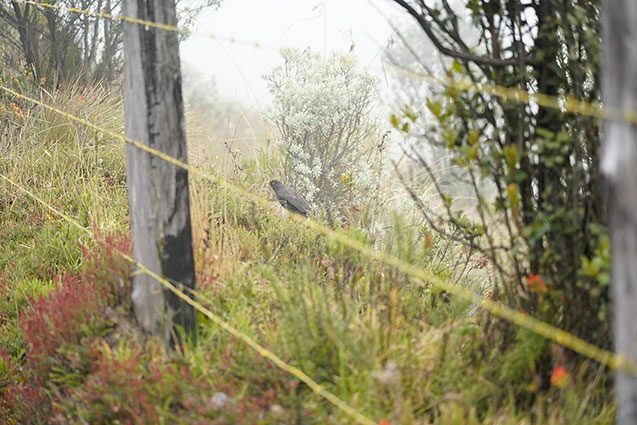 Before we set out on the trail to Nevado Santa Isabel, Ruiz-Carrascal tells me: “You’ll see species that I’m sure you haven’t seen in your life, and you won’t see anywhere else on Earth.” He’s right, of course. 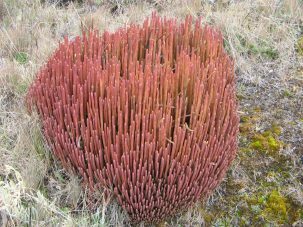 There are tall Espeletia with their palmy crowns; round, boulder-like cushion plants; and “páramo fingers” that wiggle strangely in the wind. 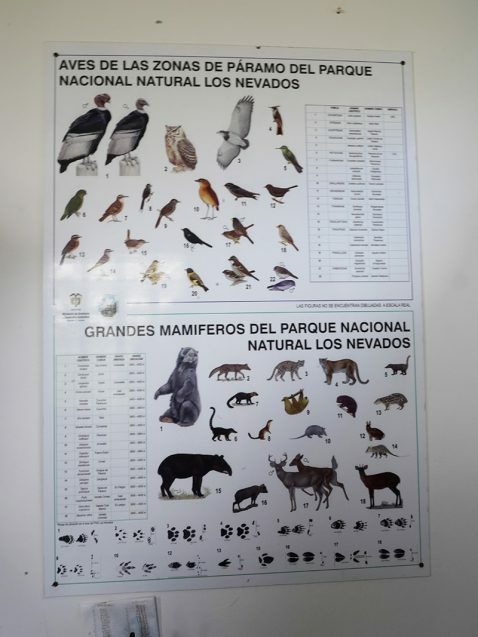 Gutiérrez-Lagoueyte points out a dizzying array of species as we walk. She’s indexing páramo species in an online catalog that contains about 500 species so far. She’s also studying how the distribution of species is shifting as the páramos heat up, and trying to determine which species could be most vulnerable. As the planet warms, many mountain plants and animals are migrating to higher elevations. But each species’ response is different. To monitor which plants are adapting in place versus migrating or dying out, the team has set up experimental plots across a variety of elevations. Every few months, they check inside the plots to see which plants are present and in what quantities, keeping watch for changes over time. Finding one of these experimental plots is surprisingly difficult, even in the treeless landscape. We leave the trail and follow Gutiérrez-Lagoueyte on a circuitous route up a hill, being careful not to step on the more fragile species. “It’s around here somewhere…” she says after a wrong turn. Finally, we pass through some bushes and stumble into the plot—a large box outlined by a hanging cord. Inside is a weather station, one of four that the team has installed, covered in boxes and wires and topped with a spinning wind vane. The technology feels jarring in this landscape that otherwise hides the marks of human interference. In addition to studying the plant composition, the team is tracking soil temperature and humidity, incoming sunlight levels, wind direction and velocity, and rainfall in this plot. Black cables stretch from the weather station’s base into the ground to measure how the plants affect soil moisture and contribute to water storage and release. “We’re trying to connect how vegetation brings the service of water regulation into the park,” explains Gutiérrez-Lagoueyte. The lakes along the trail to Nevado Santa Isabel were sacred to the local indigenous people—a place to pay tribute to the gods. The sky feels bigger and closer here, and water is everywhere, shining in cushion bogs, reflecting the blue sky and clouds in small pools, and flowing downhill in streams. The Río Claro is just a gentle trickle up here, wide enough to hop across. Farther down the mountain, it becomes a proper river, gushing and splashing. 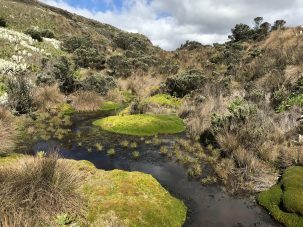 It’s one of many waterways that shuttles the moisture stored in páramo bogs and pools into the lowlands, helping to recharge aquifers during dry spells. How much water do the páramos actually dole out? And how will that change as the upper tropospheric warming changes the water balance? To find out, the team is studying the watersheds of the Claro and Otún rivers. Ortega-Arango is working on a páramo watershed model, which would be a first of its kind. These watersheds are “totally different” from the standard models, says Ortega-Arango, because for starters, there’s the páramos’ horizontal precipitation—the water deposited by fog. Peat bogs and the rapid freezing and unfreezing at different times of day also help to make these watersheds strange. Before he can start building the model, Ortega-Arango needs data. So the team is tracking streamflow, changes in snowpack melting, and how much water is stored in the bogs, lagoons, and vegetation. They are also assessing rainfall and evapotranspiration levels, to look for changes in the water cycle. Once it’s finished, the open-source watershed model will help the team to devise climate adaptation strategies and guide decisions on water use in the region. Collecting the data from the team’s sensors is as easy as pulling the sensor out of its boxy radiation shield and plugging it into a computer like a USB. Daniel González-Duque, a master’s student in water resources engineering at Universidad Nacional de Colombia Sede Medellín and young researcher at EIA, analyzes the data and merges them with global climate models’ outputs, to try to reconstruct the past and understand what the future has in store for the páramos. The team can already see a warming trend. The average temperature around one sensor has risen from 6 degrees Celsius to 6.2 over just ten years. That doesn’t sound like much, but it’s almost twice as fast as the surrounding lowlands. 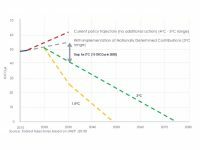 Ten years is a relatively short time period from which to predict long-term changes, Ruiz-Carrascal cautions. But he hopes to continue the data collection for decades to come. He’s growing the network of sensors bit by bit, and wants to expand into other lines of research, too—for example, taking bog cores to see what their layers of muck can reveal about the history of the region’s vegetation. 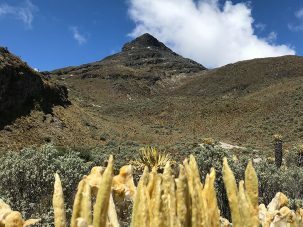 He also dreams of one day opening an observatory and visitors center to help educate the public about the páramo and why it’s important to preserve it. What happens in the Andes won’t stay in the Andes. Ruiz-Carrascal thinks of the páramos as a harbinger of climate change, providing insight into how other parts of the world will change as the global thermostat continues to rise. Despite the challenges of working in this environment, the team has installed 23 data loggers that collect temperature and humidity data every day. In addition, the team's four weather stations gather information about soil temperature and moisture, wind speed and direction, and more. How beautiful the area is and how appropriate that Columbia University has a link to Columbia through the scientists there! Much lower altitudes but this reminded me of how much I miss the Sierra Nevada of my childhood decades ago.